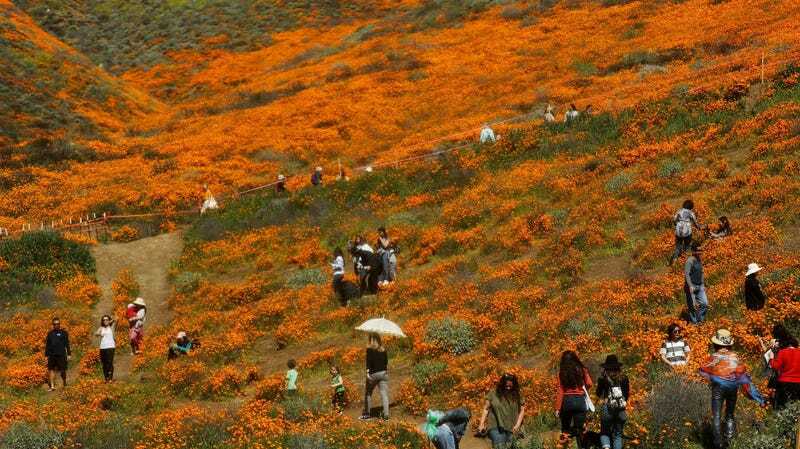 Tourists frolicking in the rolling, poppy-covered hills of California’s “superbloom” are actually ruining it with their gorgeous Instagram posts, which I am totally not jealous of. The Guardian reports that Lake Elsinore, where 50,000 tourists recently came in to witness the bloom, had to temporarily shut down access to the canyon because of the overcrowding. The mayor named the situation “poppy-palooza” on social media and residents could barely leave the town because of traffic. Residents are blaming social media, given that the poppies are beautiful and regular tourists and influencers alike are doing impromptu photo shoots in the fields. “Wow, how horrible,” I sigh, as I scroll through the photos and long for the warmth of a California sun, the sensual touch of poppies caressing my skin, and an enviable Instagram post to make my haters jealous. Not to mention there are also rattlesnakes in the area which are now biting visitors because of overcrowding. “I’d let a snake bite me to get close to those poppies,” I whisper in the smallest voice possible so as not to let my coworkers know that, given the chance, I’d absolutely be selfie-ing myself to death in that spectacular canyon. “I’d let a snake eat me if it made for a good post,” I say, in an even quieter voice than the first. The canyon ultimately reopened on Monday but had to turn visitors away once it was full. But the lesson remains: don’t go to the superbloom and ruin it with your pretty photos unless, of course, you’re inviting me. Please take me there. Please.